Major engine service, Antifoul, Anodes, Cutlass bearing in June 2018. Invoices available for inspection. In June 2017 the interior was given a professional deep clean by a boat valeting company. In the last few months she has got new carpets and curtains. Interior is in impeccable condition. Brand new bar fridge installed. There is also a new VAX vacuum cleaner and de-humidifier in the package. The yacht has a brand new bimini, bow cushions, front screen cover and full winter cover for the upper deck. Brand new mooring warps and fenders with covers from May 2015. New Raymarine Hybrid touch screen Bluetooth navigation plotter, Raymarine Auto pilot & new Radar. iPhone and iPad can be used to display and control navigational data. Engine room fire system renewed. This is one of those boats that has been loved to bits by the vendor. Over the last two years he has done everything to turn this boat into an impeccable yacht. 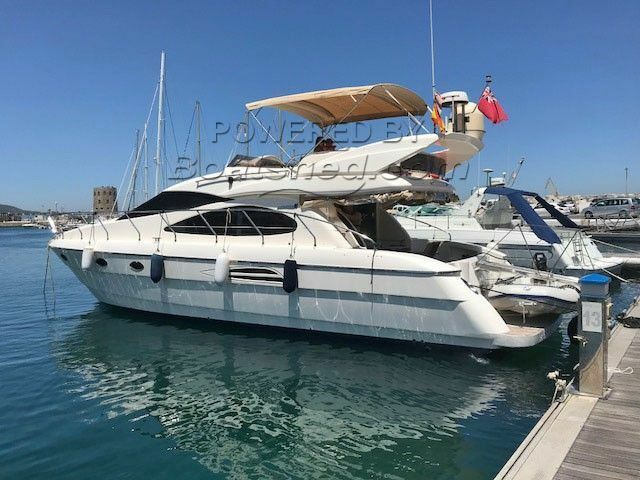 The vendor has cruised the yacht on the south eastern and south western coasts of Spain and Morocco. In other words this yacht is not one that has sat in the marina for endless months. Despite that the boat has only 920 hours on the engines. I don't normally tempt fate but I am sure that this boat would pass a survey with flying colours. I recommend an early viewing. I can supply a list of all the improvements works carried out over the past two years to any prospective purchaser. This Astondoa 46 Fly has been personally photographed and viewed by John & Lynda of Boatshed Gibraltar. Click here for contact details.